During this hot and dry month, the avid gardener should pursue seasonal tasks to keep the garden looking good and prepare for the change of seasons. Irrigation should be a high priority to sustain plants that must have a ration of water during the drought. Pass by Mediterranean climate plants, which are accustomed to dry summers. A little moisture will perk up even these rugged individuals and extend their best days, but a better use of scarce water resources would target the garden’s thirstier specimens. Roses, for example, could produce another bloom cycle during July if treated to a balanced fertilizer and watered deeply. Other candidates for regular watering are plants in containers, which can dry out fast. First confirm that your water usage is within current restrictions. If your garden consists mostly of Mediterranean climate and succulent plants, this year’s drought should not cause alarm. On the other hand, if you have a thirsty lawn, consider replacing it with plants of the summer-dry persuasion. The same strategy would be appropriate for plants from tropical, riparian or boggy areas. Blossoms to enjoy in July include gladiolus, agapanthus and fuchsia, and fragrant Oriental hybrid lilies, e.g., pure white ‘Casablanca’. 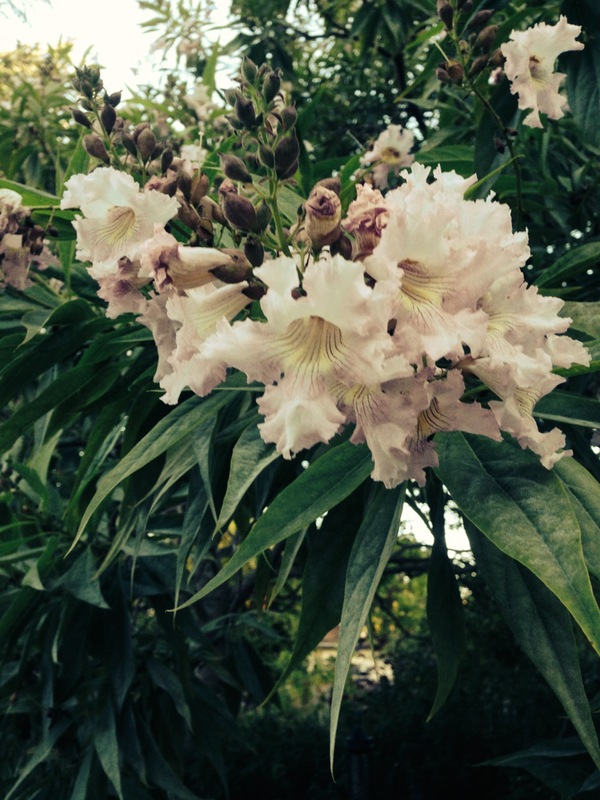 I am also enjoying blossoms of Chitalpa tashkentensis ‘Pink Dawn’ trees, which are crosses of catalpa and desert willow. They put on a show reliably around Independence Day, but opened a little earlier this year. The Corsican hellebores (H. argutifolius) have finished their winter-to-spring display, and leaned down their bloom stalks to drop seeds all around. The seasonal task is to cut stalks to their bases to make room for the new growth, which has already started. The tall bearded irises also have finished blooming for this year. They will look best after the flower stalks are cut down, the leaves fade, and the rhizomes enter dormancy. Every four years, during the period from mid-July to mid-September, dig and divide the rhizomes to promote blooming for net spring. In July and August, plant autumn-blooming blubs, e.g., autumn crocus (C. speciosus and C. sativus), meadow saffron (Colchicum autumnale), and spider lilies: Lycoris squamigera with lilac or rose pink blooms and L. radiata with orange-red blooms. Control cool-season annual weeds, currently going to seed: bindweed, chickweed, crab grass, knotweed, lambs-quarters, mallow, pigweed, purple deadnettle, groundsel, nettle, purslane, speedwell and spurge, as well as field grasses. Dispose of seeds in the green waste not in the compost bin! The invasive cheery yellow Bermuda buttercup (Oxalis pes-caprae) has already faded, leaving clusters of bulbs to sprout next spring. This entry was posted in Essays 2014, Summer Quarter and tagged Bulbs, Cultivation, Drought, Selection, Weeds by tomkarwin. Bookmark the permalink.